Hey y’all! So, sometime before Christmas I got a text from my sister in law, Curly Sue’s mother. 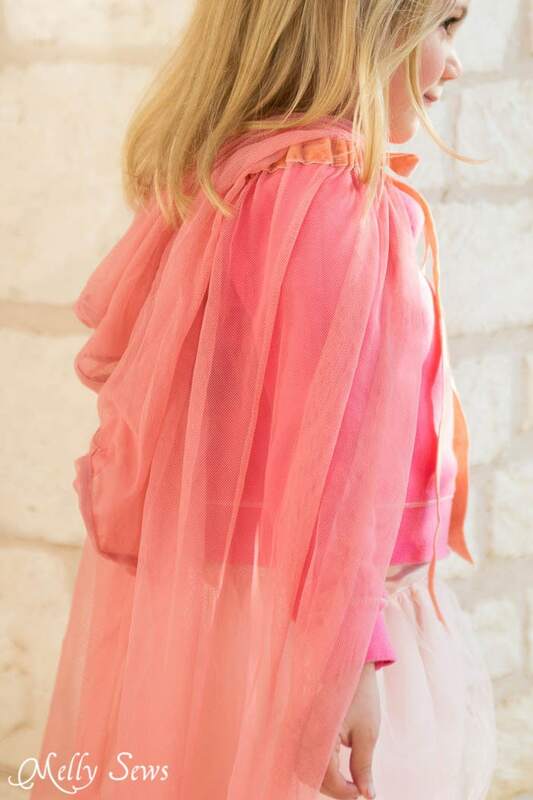 It was a picture of a sheer hooded cape that my niece was calling a “fairy princess cape” and a request for one for Christmas. Today I’m going to show you how I made it in less than 30 minutes and won the best aunt award on Christmas day. And just in case you’re wondering how this tutorial fits into February’s theme of Rest, well, I figured when you rest you dream, right? And obviously my niece has fairy princess dreams, and I think it’s fun that I get to help her imagine them. 1 1/2 yards 60″ wide nylon stretch mesh. This one (affiliate link) even has sparkles, and I bet any fairy princess would love that kind of bling. If you don’t use stretch mesh it won’t drape the same as the one I made, and if you chose to use a woven instead of mesh fabric you’ll need to hem edges. 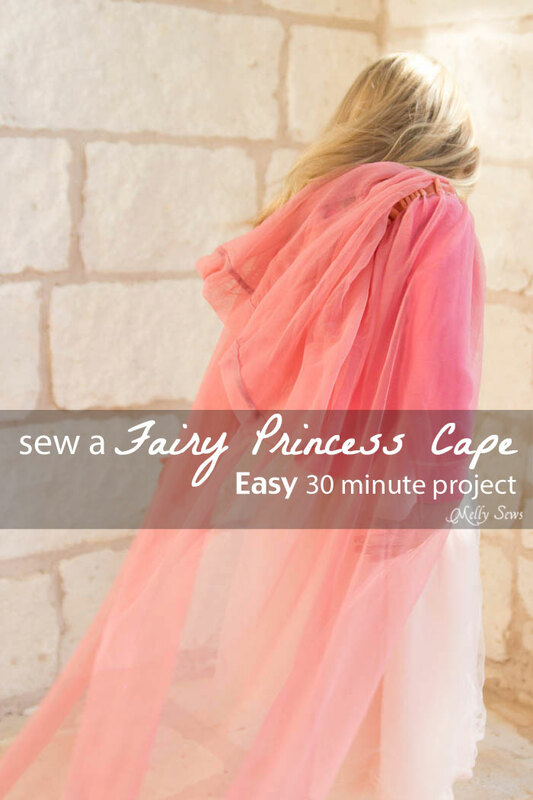 Also, this makes a cape that’s about 48 inches long below the hood, so if you’re sewing for a toddler or smaller, you may want to trim the length. So here’s how super simple this is. About 12″ down from one short edge of the fabric, sew your ribbon across, matching the center of the ribbon with the center of the fabric. Fold your fabric in half, matching the short edges, with the ribbon inside. Stitch across the short edge closest to the ribbon. Using a safety pin, thread the elastic through the channel created by the ribbon. 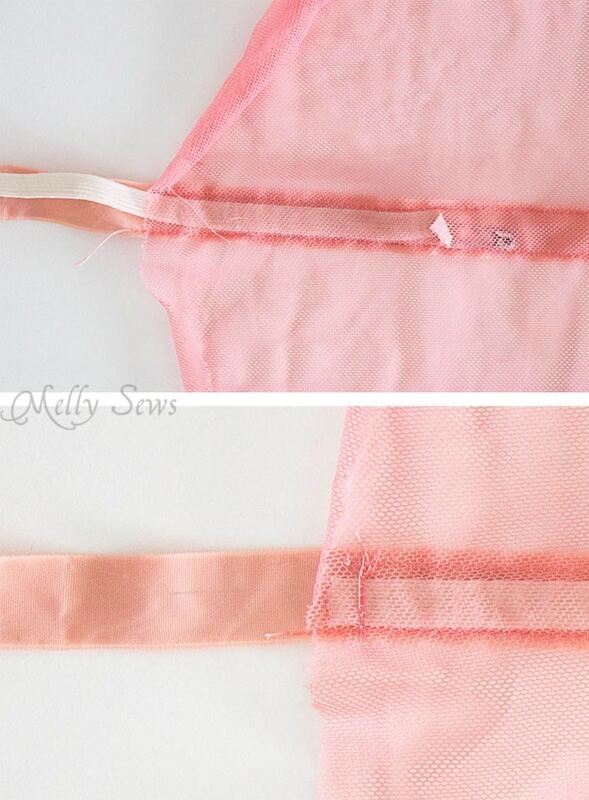 Sew the elastic to the ribbon and fabric at each fabric edge. Magically perfect! I want one! I’m one of those mothers Jacq B, it’s on my to do list 🙂 (love it). I should have known better than to check my email this morning! I have another 10 hours left in my work day, with 24 more to go this weekend! I’ll have to wait THREE days before I can make this! Pure torture! 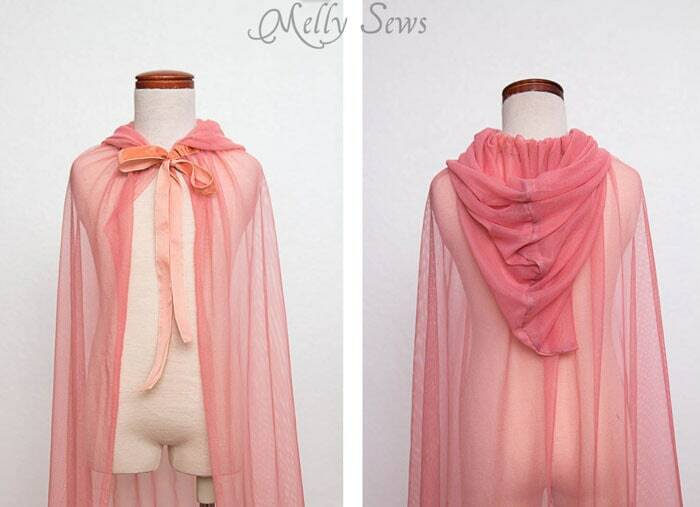 I can’t wait to make this beautiful cape for my daughter!!! Perfect for a Princess. Great easy tutorial. Thanks for the Jedi idea. Or wizard. or Zorro…whatever his/her imagination comes up with. I have a sweet little four year old in my life that puts on whatever dress-up article I make and I get reports that he wears them constantly…so gratifying. Thanks, Melly, for posting this great tutorial. I see seven of these in my sewing to-do list! This is fantastic at 8am this morning princess Anna was without a cape for world book day 8:30am this morning she is caped up and sooo happy. Thank you so much Mellissa you truly are a life saver. I love this tutorial so much! I cranked out 4 cloaks today for my kids in half a day! I searched forever for a cloak design that didn’t need a pattern printed out so thank you so much for this super simple but totally amazing idea! Thanks Melissa I just made this for my grand daughters 5th bday. I pics of you want them. I Love it and I know she will too. I LOVE IT!!!! I made the tulle longer cuz I’m 14 not a toddler and need this for a costume and it turned out perfect!!! I also didn’t do the part where you make the whole hood instead just flipped that part under the ribbon to give it more volume if that makeshift sense. Such a wonderful, versatile tutorial! It has played a role in my daughter’s Halloween costumes the last two years in a row.